Many homes are fortunate enough to have a fireplace. This is great for a cozy feeling in your living space in the winter months but is often ignored for the remainder of the year. This doesn’t mean you still can’t use the space to create something beautiful that will contribute to your home’s design. Since the fireplace will be used at some point, it is important that all decor be removable and easy to clean. Here are a few ways to spruce up your fireplace when it’s not in use. 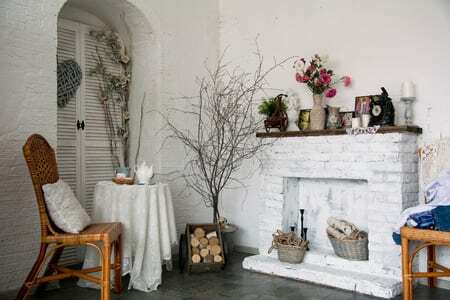 Pillar Candles & Tea Lights: This is one of the most common and easy ways to fill the empty space the hearth creates when the weather heats up. Using different heights and sizes of candles give a nice ambiance to the room while providing you with a miniature version of the relaxation you feel when observing a roaring fire on a cold night. Flower Arrangements: A unique set of live or artificial flowers can soften up the facade of a classic brick fireplace with its feminine lines. Setting them in a beautiful container will also help create a calm space. Glass Terrarium: Whether it’s a hanging design or one that can directly be placed on the ground, having a contained ecosystem in your hearth will lend a natural tone to the room while also remaining conveniently mobile. Seasonal Theme: As the seasons change, so can your decor. In the summer, an ocean theme with shells and starfish displayed with anchors and blue and white striped fabric would be a perfect fit. In the fall, try creating a cornucopia feature with pumpkins artfully arranged everywhere. Spring time is for flowers and bird figurines bringing in the good weather. Artwork/Photograph on an Easel: If a particular piece of art or photograph holds significance for you and you want to make it a focal point, try installing it on an easel with decorative touches on each side to fill the empty spaces. Books: Books and fireplaces don’t mix you say? In the warmer months, they can. Stack them on a pallet with decorate vase and pillar candle and you’ve got a relaxing view for any bookworm. The warmer months are also the perfect time to make sure your fireplace looks its best for the winter to come. Choosing new tile to surround your fireplace is a quick and easy way to dramatically change the look of your entire room. At Conestoga Tile, we have tile options that include many styles and colors, glass, even tile that is indistinguishable from wood or brick. Stop by one of our locations to find out how you can get a fireplace renovation before winter!